If you are lucky enough to have a peach tree on your property, enjoy it while it's there. According to the South Carolina Peach Council, peach trees are relatively short-lived. Most die after 20 years. Determining the exact age of the peach tree is difficult, unless you cut it down and count the rings in the trunk. Trees develop one ring for each year of growth. Instead, consider the typical growth pattern of peach trees to determine the approximate age of the peach tree. Measure the tree's height. 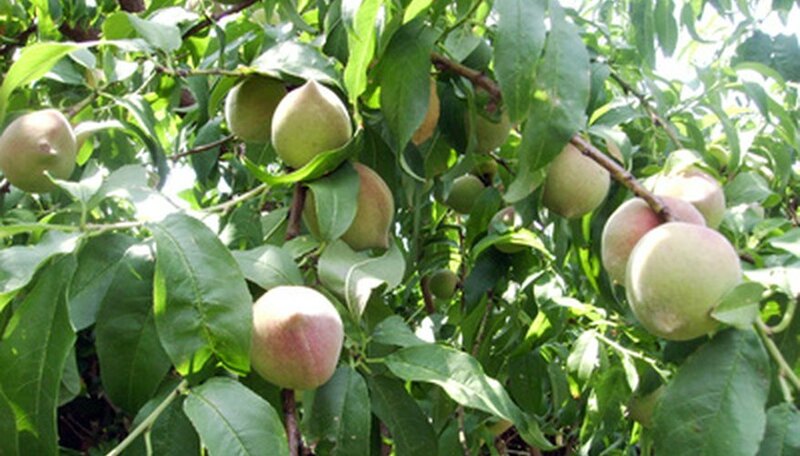 At planting, most peach trees are 20 to 24 inches high. At maturity, (8 to 12 years old) a standard peach tree is 15 to 20 feet high. Knowing this, you can estimate that a tree between those two ranges in height is a young tree, probably between 2 and 7 years old. Estimate the tree's rate of fruit production at harvest. Peach trees produce fruit as early as two years after planting, with a good harvest after four years. Eight- to 12-year-old trees produce the most fruit, with as much as four to 10 bushels each year. Trees older than 12 years decline in vigor, producing less fruit and finally ceasing production altogether. Examine the tree for leaves and blossoms. Trees younger than 15 years show vigorous growth in the spring with prolific leaves and blossoms. As the tree ages, it produces fewer leaves and blossoms and may have dead wood with no growth at all. Grow peach trees in full sun on a gently sloping hill so frost pockets drain away from it. Spring frosts in temperate climates destroy blossoms, reducing fruit. Grow cold-adapted varieties and plant them close to a house or sheltered by other trees.